When a company moves their business online, they enter a new world, a world that never sleeps. 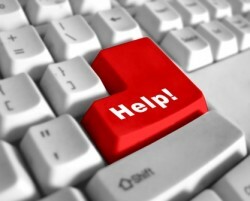 The days of writing a letter to a company or calling them for help are gone. Clients expect instant service whenever and wherever they currently are. They are equipped with internet-enabled smart phones and tablets and their business never closes. One of the most fundamental parts of customer interaction is communicating with the client about resolving issues. This usually involved a lot of paperwork and a team of people to accomplish, but not anymore. Customer support software, also called IT help desk software, is here to simplify customer interaction. Web-based IT help desk software allows clients to save time by avoiding lengthy phone calls made even longer by being switched around from one department to another. Now, a client can submit a set of questions and get along with life while the support staff compile quality answers in a timely fashion. Since the service is email and web-based, customers can submit questions via online forms 24 hours a day, seven days a week. The majority of customer issues can usually be solved in a matter of minutes. This is where knowledge base software comes in handy. The knowledge base contains articles and instructions that answer a client’s questions or solve his problems without even having to contact the support staff in the first place. Using the knowledge base is as simple typing in a question or a short description of a problem and instantly getting answers. This feature allows both parties to save time and money while still getting an issue resolved. An employer may open the system to his own employees, which means a more efficient and faster system to handle any internal inquiries ranging from company policy to technical support. The most important part of help desk software is the automation of work. The trouble ticket software will quickly and easily convert question emails into tickets which allow tracking of each customer’s problems with ease. This streamlines the whole support process and rules out any chance of mistakes or delays. Also, the customer support software keeps a record of all tickets created, thus providing the support staff with a history of each client’s interaction with the company. To top it all off, it is possible to simply purchase a web-based software solution from a professional company. This way, the people that know everything about running customer support software are in charge of security, uptime and keeping everything running smoothly. To summarize, web-based IT help desk software is the product of the future. It allows clients to receive help irregardless of where they are or what time it is. It also automates and normalizes the whole process, saving time and money for all parties involved, while providing a high quality support service to the client and ensuring a long and healthy business relationship.